On October 1, 2017, over 22,000 people gathered for a music festival at a 15-acre, open-air concert venue in Las Vegas, Nevada. On the final night of the festival, Stephen Craig Paddock opened fire into the crowd from the 32nd floor of the Mandalay Bay Resort and Casino. The gunfire started around 10:05 p.m. and continued for approximately eleven minutes, with Paddock firing over 1,000 rounds. Fifty-eight persons were killed and several hundred more were injured. 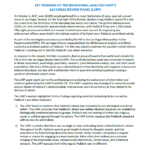 As responding law enforcement officers assembled in the hallway outside of his hotel room, Paddock committed suicide. As Engineer Schuck walked up the hallway of the 100 Wing, he observed Security Officer Campos poke his head out of an alcove. Engineer Schuck then heard rapid gunfire coming from the end of the 100 Wing hallway that lasted approximately 10 seconds. When the gunfire stopped, he heard Security Officer Campos tell him to take cover. Engineer Schuck stepped into an alcove and gunfire again erupted down the hallway coming from Room 32-135. The gunfire lasted a few seconds then stopped. The gunfire started again after a brief pause, but Engineer Schuck believed it was directed outside and not down the hallway. 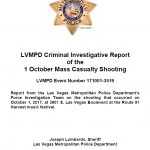 Meanwhile, inside the Las Vegas Village over 50 Las Vegas Metropolitan Police Department (LVMPD) personnel were on overtime assignments for the Route 91 Harvest music festival being held at the Las Vegas Village venue. The initial gunshots were heard on an officer’s body worn camera (BWC). 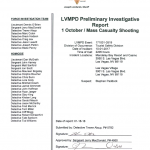 As the suspect (Stephen Paddock) targeted the concertgoers with gunfire, officers quickly determined they were dealing with an active shooter and broadcast the information over the radio. During the month of April 2010, we have received the same message twice from the Las Vegas Metropolitan Police Department concerning a Law Enforcement Sensitive brief entitled “Silver Shield: Nevada’s Approach to Critical Infrastructure Protection” from November 2007. The briefing discusses various aspects of Suspicious Activity Reporting, Fusion Center integration, and the use of unmanned aerial vehicles (UAV) to patrol portions of the city for aerial photography during incident response.